All considered, one of the most intriguing things about this book is its finality: by committing these twenty-five collages to pages and text, we’ve implicitly agreed to view them as being in their definitive state – a notion which, in Travess Smalley’s practice, is often in question and never a given. Travess is an uncommonly prolific artist, engaged in several different bodies of work at any given time. He rarely thinks in terms of the Fully Realized Art Object, his interest lying more in cumulative effects: as he shifts his attention from series to series, he builds a consistent visual language that gains further expression and gradual refinement with each succeeding project. It’s an approach defined by constant experimentation and frequent reworkings, inscrutable material processes and impermanent states. Discoveries made while completing one project often alter the directions he takes with others, and it’s not uncommon for works presented in a given setting to reappear elsewhere, newly changed in the wake of some fresh inspiration. So in considering these collages as they’re presented here – which is to say, as a coherent group of printed jpegs that embody some of the defining tenets of Smalley’s practice – it might be useful to think of them almost like photographs: frozen images from an artistic process in perpetual change. With that in mind, this series is best understood as an exercise in formalist problem solving – documentation of hours spent working out questions of composition, color, texture, and space. 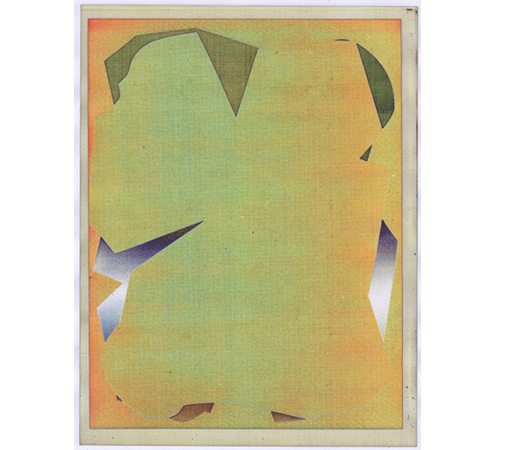 Beginning with a series of his own digital drawings and patterns, Smalley established an exploratory, largely improvised process in which those elements were printed out, cut up, layered and arranged, scanned, altered digitally, re-printed, drawn on, re-scanned, and so on. With each step, he revised the works – adjusting layouts, correcting colors, adding and removing elements as desired. He also saved each iteration as a jpg before moving forward, a practice which freed him up to follow his ideas wherever they might lead – after all, why hesitate in altering, even destroying an image when you have it backed up, waiting to be recalled and reworked? At any given point in the process, then, each piece existed in at least three different states simultaneously: physical (the paper collage), digital (the scanned jpegs of that collage) and, as printed reproductions, somewhere in between – and as becomes quickly apparent in discussing his work, it’s those “in betweens” that tend to interest him most. This penchant for blurring boundaries carries over to Smalley's handling of his materials. His method is generally one of (a) identifying a given tool's defining traits and then (b) developing strategies for accentuating and/or confounding those traits – a process which frequently leads to a disorienting combination of physical and digital methods. At various points in the series, for example, we see the artist scanning a piece of wire mesh to echo an existing digital pattern (pg 17); using an exacto as a markmaking instrument (including, at one point, mimicking the effect of the vector “pen” tool (pg 43)); manually (and repeatedly) scanning portions of a given composition in order to corrode pixel quality and achieve a range of half-tones, gradients, and “burns” that simulate the effects of digital software (pgs 11, 33, 39). With notions of medium, origin, and objecthood becoming quickly obscured in the process, these resulting prints consistently update – and expand upon – traditional strategies for creating and presenting collage. Throughout all of this formal experimentation, Smalley is referring to, borrowing from, and combining a broad range of influences. There are, on one hand, the various strategies plucked from art history, particularly 20th century modernism. Some of these allusions are stylistic: echoed throughout the book, for instance, are the bold colors and abstract shapes of Matisse’s Jazz-era decoupage, the line work of Picasso’s later paintings, and the singular compositions of Joan Miro. 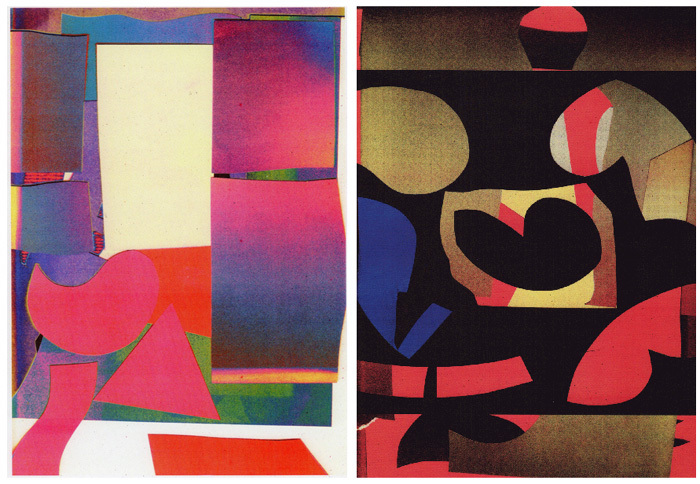 Others can be found in Smalley’s formal decisions: in some works, we see the artist intensifying his colors by juxtaposing large areas of pure, strident tone – a trick picked up from the Fauves - while numerous other pieces find him embracing the sharp colors, jagged forms, and cacophonous layouts favored by Futurist painters. Closely observed and deeply integrated, the lessons learned from these various artists provide a crucial framework for Smalley’s experiments, but not all of his references are so traditional or academic. Much of this work, for instance, reflects his obvious (and, it should be stressed, unironic) affection for the hallmarks of late-80s/early-90s visual culture: the stylized illustrations of trapper keepers, the cyber-psychedelia of rave flyers, the pure-pleasure aesthetics of Ocean Pacific t-shirts and Magic Eye patterns. Other, more recent references include those made to web 2.0 graphics (particularly its gradients) and manga comics (both its paneling strategies and its action-sequence line work). These “low-art” influences, having clearly played an important role in shaping Smalley’s graphic sensibilities, are treated here as being no less legitimate or useful than the inspiration he’s found in museums and textbooks. They’ve also had a permissive effect on the work, invested as they are in visual pleasure over academic strategy, and lend to these pages a welcome element of playfulness. Traditional or unconventional, low or high, it makes no difference: everything Smalley has seen and loved, aesthetically speaking, is incorporated into his art, and it’s this ability to merge disparate influences into a singular style that allows the results to feel at once familiar, contemporary, and forward-thinking. 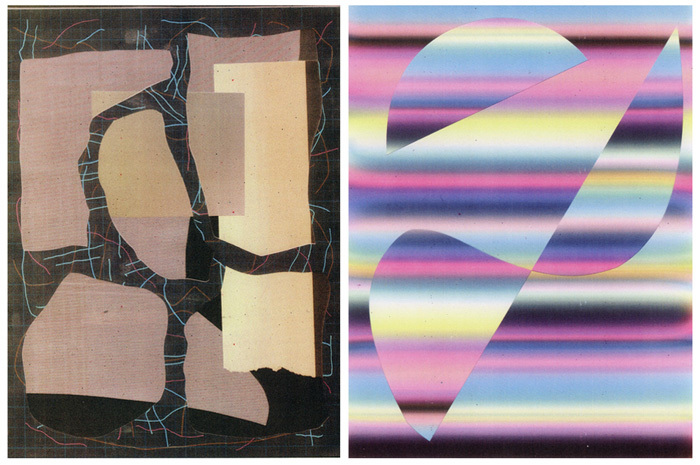 Like so much of Smalley’s work, these collages are ultimately about balance: between compositional elements, between assorted techniques and media, between disparate influences, between digital and physical modes. Taken together as a series, they embody the formal intelligence, material inventiveness, and confounding of terms and tools that have come to define his practice. Travess, of course, has since moved on to a group of new projects that further develop the ideas explored here - a wide-ranging list that, as of this writing, includes large-scale vinyl prints, abstract videos, plaster vases, and images created with scanners and clay. Working at this diligent pace ensures that he rarely stays with one series for very long. With the publication of this book, however, we’re given the chance to pause and reflect on a particularly fruitful point in Smalley’s ongoing explorations.